Made of stainless steel with a polyresin slice of strawberry cream cake! Closing date will be 27 June 2009. I'll make little number squares and randomly draw a number; the number drawn that coincides with the comment post number will win this item. Results will be announced on 28 June! If you don't have a blogger profile/blog, please leave me an e-mail address! 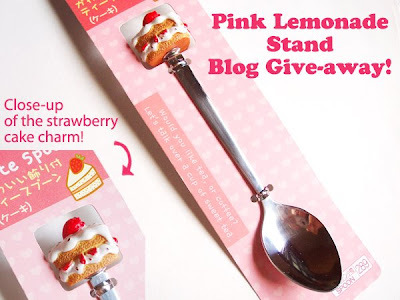 This giveaway is open internationally and to everyone! I'll be having more giveaways in the future so keep an eye on my blog =) Have fun! Tonight, I posted my own first giveaways on my blog, below. I love the Original art ACEO - Cute, Fun Happy Tree Gang. Wooh! ACEO handicrafts are so adorable! Who would have thot of stitching up an apple core? Love the original art as well! I love your "Flapper girl in Blue"
I love this one http://www.etsy.com/view_listing.php?listing_id=10632076. We are waiting for strawberry season to start here and this is so pretty and yummy looking! Your shop is adorable! My favorite is the Starlight Falling on my Head Original Illustration. I love your Nouveau Melt illo! Actually, your whole Nuoveau series. Your markerwork is great! Copic? Ahh! I would love this spoon. I'm just getting into bento-ing, and this would be a perfect supply. My favorite thing in your etsy shop is http://www.etsy.com/view_listing.php?listing_id=21251701 because I loove food! Especially desserts. WOW! You are a fantastic artist, beautiful, bright, bold colours! I really like 'cupcakes served', simple and cute!! hehe everything is so cute. i love the Handstitched Felt Quilt - Sakura Girl! I like the Handstitched Felt Quilt - Cute Apples - Original art ACEO. How talented you are! What a lovely blog you have! And such a sweet give-away! I very much love many things in your store, but the 'cupcakes served' print takes my fancy the most! Thank you for holding this give-away! 'Nouveau Melt' is definitely my fave! i truthfully adore your own writing type, very attractive.